YouTube to MP3 is a classic example of an application designed to do one basic thing, and do it very well. Have you ever wanted to save the audio part of a YouTube video? The YouTube to MP3 converter app is just what you’re looking for. 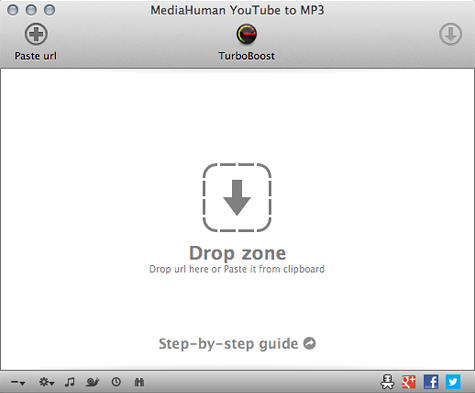 The application works by detecting the audio track in the YouTube video, and then it downloads the track, skipping the video part. Since the original format is saved, without conversion, there is no loss of audio quality. When you first open the app, the main window appears. This is where all the action happens. This single window user interface is one thing that I appreciate. Before I get too far ahead of myself, I have to mention that the app relies on input from either your web browser or the clipboard before it can download anything. Unlike other similar software, YouTube to MP3 does not have a search field or feature. This didn’t bother me. If I had to guess, most of us (myself included) have a web browser open all the time anyway. Once you’ve gotten the YouTube video you’d like to pull the audio from, copy the URL from the web browser, return to YouTube to MP3, click the Paste url button, and you’re done. A progress bar in the main window shows the progress of the download. You can also drag-and-drop the URL into the app’s main window. Taking a look at the app’s preferences, there are five different sections. Under the General tab, you can set the download behavior, notifications, and update checking. Under the Download and Network tabs, you can change the default settings for downloads and proxy servers, respectively. Under the Music Output tab, you set where your converted auto goes, the output format and quality, and adding to iTunes. Finally, under the Tags tab, you can add tag information. Thus far, I’ve referenced YouTube when referring to converting video to audio. The program doesn’t stop there. In addition to YouTube, you can also paste URLs from other popular video sites like Vimeo, Soundcloud, Dailymotion, and VEVO. When it comes to getting audio from YouTube videos, YouTube to MP3 is a great (and FREE) option.